In today's competitive marketplace, managers and engineers demand mechanical contracting services that offer and deliver high quality performance at fair prices. When Powerplant Technologies (PTI) enters your facility we bring extensive engineering and construction skills as well as a fully functional and closely monitored Quality Control Program. 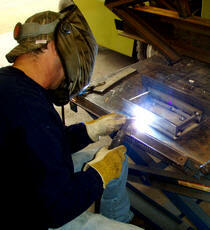 We also bring a well developed and documented Corporate Safety program that meets or exceeds all OSHA standards. Utilizing in-house resources and additional contracted resources, PTI can package a complete service that qualifies us to perform any project, large or small. PTI provides the high quality workmanship, materials, engineering and technical support that you need for all of your mechanical, powerplant or process system requirements. Welding on Haynes 230W component for vortex design.